This card features ribbon from Sharon Johnson’s Stamp Simply store. She is featuring cards made by others with her ribbon so I am happy to oblige. This ribbon is so wide it can be used as a layer! You have got to get some; she is also now selling a cheap little tool to help you tie perfect bows plus other fun stuff! Her store links are just above her blog header. Another fun sketch from little Madelynn for Twinkling Tuesdays. She sure comes up with some interesting sketches. I really loved this one. Not much to tell, all pretty obvious. Oh, there was one fun thing. I didn’t cut into a single full-sized sheet of paper for this card! All scraps! WOOO HOOO! I hope you will play along! 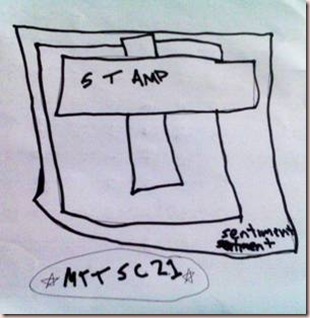 Upload using MTTSC21 to SCS or PCP or your blog an link to the Twinkling Tuesday blog. I hope you will visit all the other Twinklettes (links on sidebar) and be sure to leave them some LOVE! Oh, and don’t forget to give your own miracles a hug! 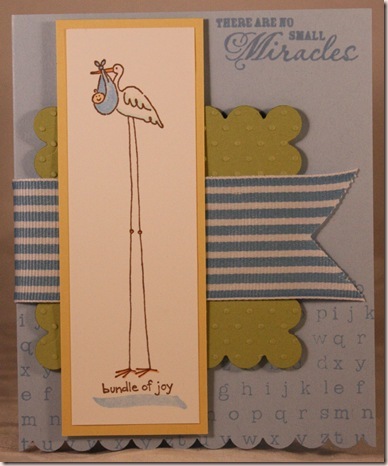 Stamps: Sentiment-Verve, Stork and alphabet mini background-SU! Paper: bashful blue, white, celery, banana CS-SU! Accessories: Cuttlebug swiss dots folder, Copic markers, foam dots-Jody Morrow, ribbon-Sharon Johnson, scallop punch-SU! So cute — love the card and your use of the wide striped ribbon — FAB job!!! i ♥ this card rebecca!! love the colors and the soft texture on the base! great ribbon too! I LOVE your card. It is so cute. That’s great you were able to use your scraps!! This is super cute and how awesome that you got to use all scraps! Love that feeling! That ribbon is lovely, too! Awwww Rebecca what a SWEET post!!! You are one awesome mom!!! You just keep on cuddling that little boy.Your card is sooo cute too! Love the stamp!